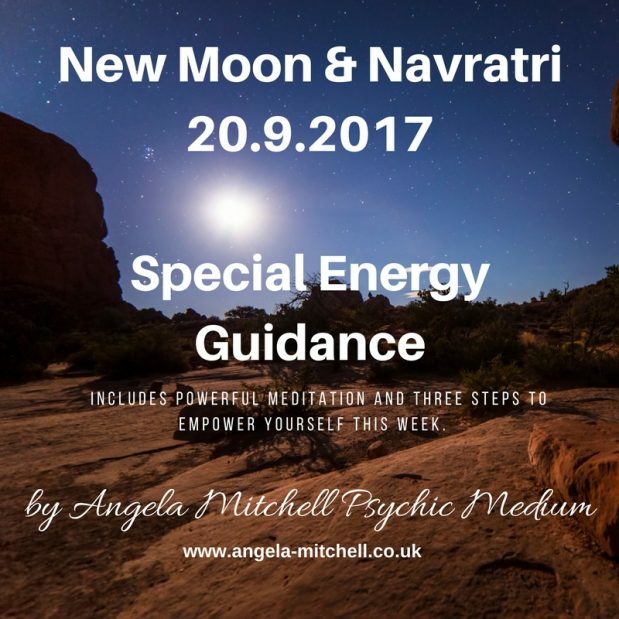 The New Moon is often over looked when one talks about Moon energy. The Full Moon is well known and pushed forward as the time to release and let go. Moon energy, is a cycle in every way possible and needs to be slowly introduced into our auras as it triggers growth and change. If you do it all at once then humanity will be overwhelmed and sanity will be questioned. Everything that falls into our space has to be done in stages and gently. Even with that amount of care, some of us can be so desensitised that we rarely understand the subtle signs until we are faced with it. The emotions activated the week before and a few days after the New Moon are usually raw, and very much in line with our soul’s mission. 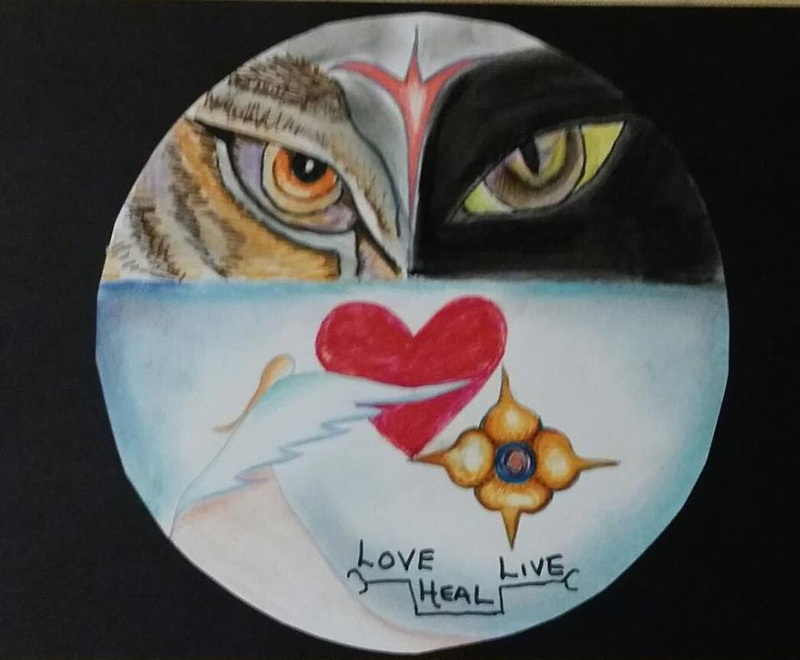 Every one of us are “spirits” having a human experience, with a purpose. Unfortunately as more experience we clock up, we also tend to be conditioned to stray away from our original goals. We may have been told that were are “not good enough” to be something or someone. So we stop ourselves from even trying a skill or love. This creates an inner resistance because although your mind tells you what is NOT possible, your soul is determined to lead you to what IS possible. So until you face up to these clutter within, we will be going around in circles and living the same story, again and again. So here is where the New Moon saunters in each month, stirring up old stories, clutter and dark matter that we try to suppress. Things will crop up, people will crash into your lives, events will occur out of your control – all forcing you to run around like a headless chicken. You will then see changes, action and solutions by the time the Full Moon comes in. The New Moon is like the bad cop and the Full Moon is the good cop! There are events astronomically as well as spiritually that align closely to either moon phases that accelerate and amplify the effects. This month’s new moon falls on Navratri which is the Hindu nine night festival that ends with the “the victory of good over evil” which then culminates with the festival of light – Diwali. The Goddess Durga, is worshipped through offerings, dance and religious events during this festival. Each area in India and their respective communities have a different way of celebrating from different deities celebrated on each day, to types of prayers, music or dance to traditions. You can read more here. There are some huge injustices happening within our societies and indeed, the world right now. From human to natural forces, it doesn’t feel fair and suffering seems endless. It feels like everything has to fall apart, be completely broken in order for it to be rebuild and made complete. The guides tell me that there is a huge secret to be revealed or dislodged (perhaps something from underwater?) and there is going to be big shift in world politics very soon. The strong will be weak and the weak will be strong. Most of us fear the unknown. We also fear ourselves. Imagine standing in a room full of mirrors. Your image plastered all over, looking back at you with no where to run or hide. How many of us can say they would be 100% comfortable in that room? Not many I suspect. Shining the light within to see clearly, the things we have spend a lifetime trying to hide and hide from, can be a very emotional and upsetting. I know so many people who want a reading but are too scared because of what will come out. It is because they are terrified of the things they don’t want to face. When the light is shined on us, we have to take it warts and all. It is also believed that Goddess Durga was created by Lord Vishnu as a warrior goddess to protect the good people against the demon, Mahishasur. She is the combination of all the Gods energies and their power. The demon had declared that “no man” could ever kill him, which is why a female deity was created. Durga is the protector of the good, the women and children. She is justice and infinite. She is the light in the dark. Durga is a Sanskrit word which literally translates into the one who eliminates sufferings. She is usually depicted with eight or 18 arms holding an object or tool in each hand, indicating that she is fully equipped and ready for battle. Durga symbolises freedom from fear, justice, winning the battle, being alert and ready for anything. Durga Amma is worshipped for help with fertility issues, strength, endurance and positive outcomes. Emotional – how are you feeling? Write down how you are feeling and then dig deeper – ask yourself why is this coming up now. What is bringing this up. Are there changes to your mood? Being irritable and angry. Is there something within that you are not facing but driving you to react badly to situations? Stop and consider because when you react straight away then you have no chance of correcting yourself especially when it concerns other people. Tears will also be significant for some people as when you have been in a state of mind or situation for so long, it inevitably becomes your “comfort zone”. Make a conscious decision to “let go” and you will see everything soften and shape up nicely for October’s Full Moon. Physical Symptoms – as the shedding process get underway this week, our chakras will be activated and problem areas will be highlighted. For example if your throat chakra may cause you to clear your throat more often this week, and symptoms such as coughing and congestion in the throat encourage you to speak up, communicate your truth and not to feel suppressed. If your stomach keeps churning this week (and not because of an existing medical issue) then you are being encouraged to let go of “confidence issues”. As the chakras work extra time this week, you will find yourself feeling very overheated and thirsty. Please drink lots of filtered water or lemon water. 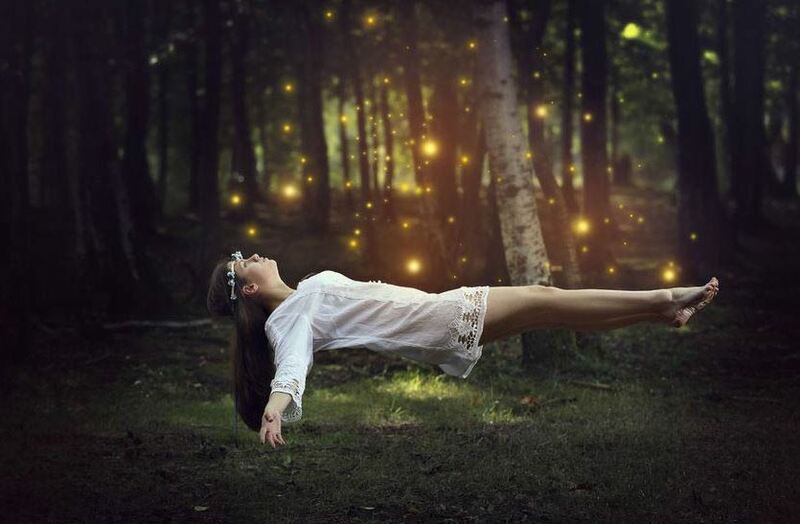 Dreams – most of us have vivid dreams but don’t always pay attention to them. This week you will find yourself going through massive journeys during dream time. Watch out for the moment before you wake up because the messages and clues from your soul will be likely to be given right before you wake up. Pay attention to any lingering words, images or scenes you may be seeing or hearing in your mind the moment you start to wake up and just about to let go of sleep. For example I had a roller coaster of a lucid dream and the last thing I remember was drinking from an artisan bottled drink. It was one of those fancy combination homemade drinks like rhubarb and poached pears or something like that. The more I was waking up, the label started to look fuzzy but one word – “turmeric” got brighter and brighter on the label. I knew it was relevant as my grandmother was a healer and medicine woman. She used turmeric for everything and it was her way of telling me to consume some to help me with a health condition. What is happening around you – there will be lots happening. From people pushing your buttons to events completely out of your control. There are two reasons for this, one will test certain aspects of what you need to let go and the other is to push you out of your comfort zone. You will face these tests to either show you how far you have come, for example your reaction to someone may have changed compared to three months ago. The other will be to make you understand why you need to let go of a particular emotion or reaction. A situation will arise and you will regret how you behaved which will trigger the release. The moment you realise what it is you need to let go off, then the process will kick off within you. To let go, to change to evolve – we must WANT it. Mirror Work Meditation – Take a moment anytime this week to do this powerful exercise. Find a comfortable and quiet place in the house where you won’t be disturbed. Have a notepad and pen next to you on the floor. 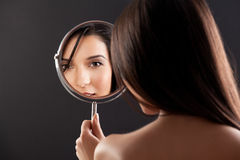 Place a tabletop/vanity mirror on a table infront of you. Make sure you can see your full face in it. Listen to this beautiful music on your earphone (https://www.youtube.com/watch?v=UkM-FjfN6Mc&t=2367s) as you are likely to get the full force of the vibrations that way. Take a few deep breaths with your eyes closed. Let the palms of your hands rest on your knee, facing up. Feel the sound waves go through your body from your root chakra to the top of your head and back down. Slowly open your eyes and look at yourself in the mirror. Look at the image in front of you. Don’t judge your flaws or imperfections, just look deep into the eyes, take in everything. Just be and look at yourself while you keep listening to the music. Let your body guide you. If you feel like you need to close your eyes, do it. Don’t analyse or try to control this moment with yourself. Write down anything that pops into your head. You can do this for 10mins or 30 mins or an hour. There is not min or max time for this. Go with the flow. Look at the words afterwards and ask yourself what it means and why it was given to you. In summary, this is a time for justice, redemption and personal freedom. Things will fall into place, even if its not entirely clear how it will benefit you straightway. Some of us will begin this phase finding themselves trying to get “justice” as it feels like going up Mt Everest. Everything feels difficult and full of resistance but trust and put your positive foot forward because there is light in the darkness. It may not be everything that you want but it will be enough for you to move forward. This auspicious new moon will empower you to “follow your dreams” if you let her. If you are open to Hindu deities then please do listen to this beautiful Durga chant song – https://www.youtube.com/watch?v=0GuCDLdrvkA Listen to this in bed before you go to sleep. It is super relaxing and powerful. I love to hear from you. Has this resonated with you? Come back and feedback when things fall into place. Whatever your story, I want to hear it. Leave a comment here. Happy Navartri and New Moon! I have taken some time off today to work on my admin as admittedly, its been something I have been pushing aside. Armed with an iced latte, as it was too hot to drink it in its true form, my trusty laptop and an earful of music, I was ready to get to work. There are no distractions here other than the laughing teenagers, the grumpy man on the phone, the elderly gentleman with his newspaper which went over my head the moment I put my earphones on. Every now and then, a song would come on the playlist, an image, a photo, a trace of a memory or a face would throw me off. Tears would start to fill my eyes, threatening to smear my mascara, ruin my make up and make a fool of me. I would hold it, live that moment, let my thoughts follow that space and live it. The tears would hold back and the emotion would fade. Then something else would jolt me out from my determined stride to get things done. I still push on and on despite the feeling over overwhelming sadness and wanting to wallow in self pity. I am not even sure what I want to be wallowing in on. It feels like the end of something or someone. Who is this, what is this? I keep asking. I am almost fearful of “knowing”. The last time I felt this way, choked with emotion and almost surfing on a wave, I lost someone dear to me. I know there is a lot of emotions flying about these last two days. The world lost Louise Hay, the motivational author and the founder of Hay House yesterday (Aug 30), which was the anniversary of the passing of Dr Wayne Dyer and today, the world mourns another inspirational figure -Diana, Princess of Wales who passed 20 years ago. However the energy emerging from next week’s Full Moon is strong and creating some chaos within ourselves. ve habit that we have become accustomed to? Is our body resisting the change that is coming? There is only one thing to do when this happens – GO WITHIN. The answers are never out of our own soul, internal wisdom or intuition. Our compass is going crazy for a good reason. Find some time to sit quietly and ask yourself all the questions above, ask for guidance from within. Light affects people in a way that nothing else does. It motivates, renews hope, energises the body and brings in growth. This is particularly important if you have been deprived of light, wallowed in the dark, crippled by fear and starved of hope. Imagine a marathon runner who has trained, strained and endured the distance. I bet the first thing they would reach for after water is a good shower. The layers of sweat, dirt and tiredness is washed away and replaced by a cool freshness and clarity of mind. As the light envelopes us in the some parts of the world, when spring has sprung, the equinox already in the way and the birds are chirping in the trees that are coming back to form, the dark is over for now. There is renewed vigour, ideas, plans and decisions to make. Some of us have had things in the “Pending” box for too long causing pain, anxiety, fear and being in a sort of a limbo. Have you seen some rapid change? Yes my dear friends, there will be plenty coming quickly to sweep us off our feet. Decisions – you will find that an external influence will force you to make decisions. This could be related to work or relationships but either way it will be hard at first but trust it is in your best interest in the long run. 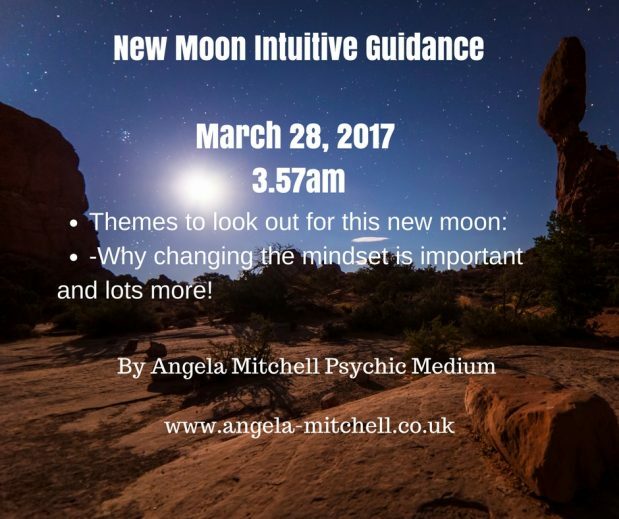 Ideas – this is a very productive New Moon and energy wise, the answers are in the air literally. You will find yourself asking questions and finding answers in the corner of your mind. We sometimes go through life being very protective of our ideas and worries. I know people in the spiritual business for example can be rather guarded as they want to be the “best” and “perfect” so that people will think they are successful while grappling with issues in the background. Wanting help is not a weakness and it doesn’t tarnish your reputation. I remember speaking to a customer who is now a friend, about running out of steam where Instagram was concerned. “People post all these amazing photos and I don’t think I have anything of interest” I moaned. Little did I know that she was a social media expert! She gave me some practical ideas. I am so glad I opened up to her as it helped me so much. She didn’t think less of me because I was struggling with something. Mindset – there is a strong message about self care, self worth and feeling good about yourself for the NOW. I had this message yesterday as I was feeling low and I did something nice for myself – I treated myself to a manicure with some lovely two toned nail polish. It made me smile and I felt revitalised. Do more for YOU. We go about life thinking there is a magic wand out there that will make everything alright. The solution is very much in YOU. So if you want to manifest and get things to shift in the right direction, then be in the right frame of mind to open the gates. If you don’t feel good then how will you even accept or sniff out opportunities? I know someone who keeps dismissing good ideas and suggestions because they are miserable. There is no way to make them see what they are missing until they figure it out themselves. Imagine that negative thoughts, anger, limiting believes and focusing on the bad stuff as an obstruction in a vacuum cleaner. It’s going to as far as it can and then start wheezing and possibly burn out until you unblock it. Imagine your aura and your mind as being clogged and blocked. Clear it by being kind to yourself, meditate and focus on the good. Pain – there will be some form of heartbreak for us. People in our lives who have been suffering will be released and taken quickly. Don’t be alarmed but when it does happen please believe that they were being spared. They will be highly sensible people with a strong sense of independence. I am saying this a huge amount of love and care as I know it can scare people when we approach this subject. Obviously not all of us will be affected but there is comfort in knowing that those who are leaving need not suffer anymore. So in summary, things will move at a good speed, you will be looking at new ways to an existing problem, asking for help or partnering with someone who can help. I feel trust is going to be something you will have deal with. We must learn from the past but it shouldn’t dictate our decisions and believes now. There will be people from the past re-entering our lives now and forgiveness will be another theme for us. You can only heal a broken heart, life or relationship with forgiveness so you can both move on. Decisions or situations which has been hanging over you, being taken out of your hands so yes it will be difficult to deal with but it’s for the best. There is a bit of a clearance happening energetically so all these things will come unstuck. Good or bad, it will make way for a change, giving birth to new ideas or even an opportunity to do something different. There will be some good out of this so please trust in the universe. Write down something from your past -that you want to let go of (e.g heartbreak, not trusting people, anger, grief, feeling cheated, not feeling good enough etc) on a piece of paper. Write down on another piece of paper – how you want to feel (happy, trusting, calm, strong etc) and on the same paper, write down one thing you really want to manifest NOW ( a new partner, 20 new clients, find a house you like, children, a new job etc) You can be as specific or as vague as you want. Don’t put in things which have variables to it such as lottery wins. Get some good quality sage or sage incense/ or Nag Champa, sandalwood or Frankincense and clear the energy in the house before Monday night. 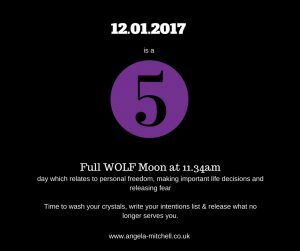 For full details on the Moon Ritual you can follow my FREE guide here. You can burn the second list saying “I want to manifest, I would like to have this…… in my life” or alternatively, date it and leave it on your altar or somewhere safe. I do what I am drawn to every other month. New Moon blessings to you and your family. 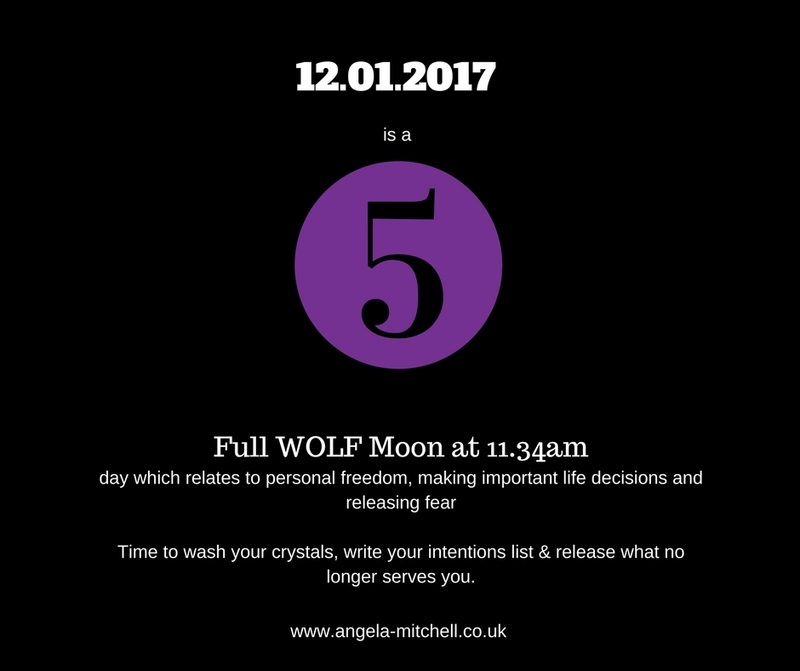 Our first full moon of 2017 falls on a number FIVE day which from a numerology perspective, a power day. The full moon this month is actually called a Full Wolf Moon. It was named as such after wolves howled at the moon in hunger. 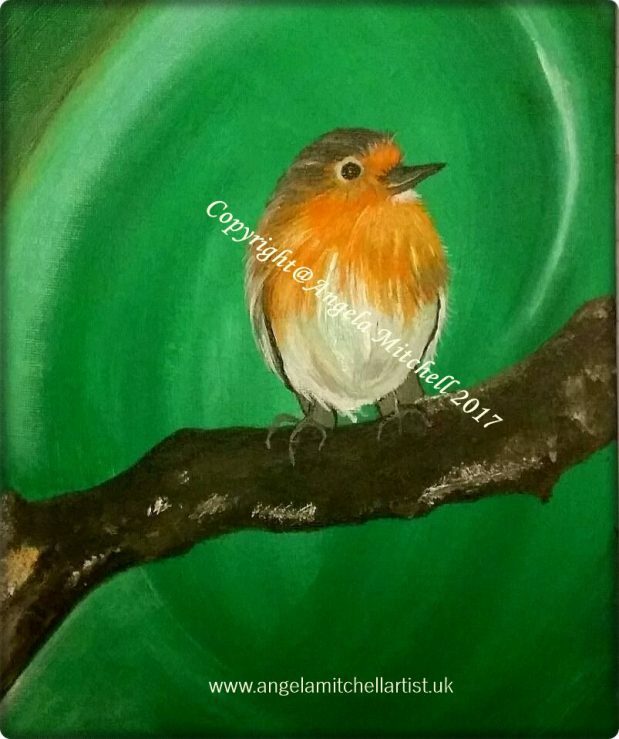 How appropriate that the animal symbol, the number and the energy right now have a common theme – personal freedom and releasing fear. Wolves are animals of instinct, incredibly clever and have a strong desire for freedom. They are also highly connected to nature and need space to explore. As a spirit animal, they encourage us to trust our instincts and be guided by our intuition, not fear. Now, 1+2+1+2+0+1+7= 5. Spirit seems to be guiding me further into understanding the energy and value of numbers these last couple of months. Sometimes we need to connect the dots to get the big picture. I feel that adding the number to the messages of tomorrow will provide a little more clarity to this guide. The retrograde recently and the full moon tomorrow encourages us to face our fears, which in turn releases us to move forward. The Number 5 touches on making sensible health and emotional decisions. This may be that some of us, as we do, put ourselves last on the list and forget to take care of ourselves. If this resonates with you then, find time and space to address what it is you are hiding from or mot wanting to face. Take little steps and try to keep to it. Five also relates to us having learned important life lessons over last year which we can now put into action. It also reminds us that no matter how difficult the challenge, there is always something that you can take away from an experience.You may find yourself releasing emotional ties, even people and attachments that have held you back in the past. This provides us with more freedom to start moving forward. So how do you tap into this remarkable energy? The full moon will be in our skies at 11.34 am tomorrow morning in the UK. Obviously it may be obscured by clouds but the energy will be crystal clear. Please follow my Moon Ritual guide which is FREE for you to access. Do it tonight, tomorrow or on Friday. The moon energy is most intense the day before and the day after. Tap into this amazing gift to us to help manifest your dreams.